Most servers out there are running off of x86 chips. What is new out there is servers running off of ARM chips. For those who don't really know what ARM is, it is a CPU architecture that uses less power than Intel (and possibly AMD) x86 processors. The image above is of Jon Masters powering a Calxeda-server from HP with nothing more than a bicycle and some extra equipment that would be necessary for a productive server (400 watt inverter, a 35 Ah battery, a UPS and a Pedal-a-Watt to be exact in this setup). Most notable is that this server is running 32 ARM cores - all with Jon Masters pedaling away on this road bike (you can see that the wheel is propped up on a stand). The demo was mostly meant as a proof of concept, but this can easily become a productive method of powering our internet's servers. 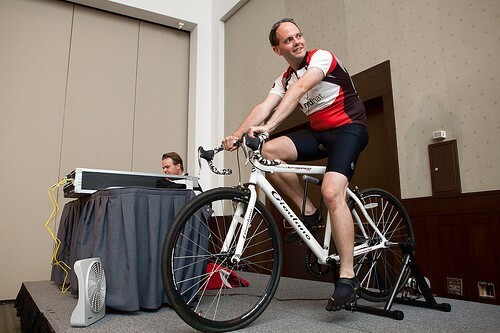 On the plus side, pedaling to power the Internet might help solve our global obesity epidemic (which is really good). You can check out this awesome rig with the video below. I'm testing HTTPS support with this video :).